Ah, the leisurely pace of summer. I have been loving it. Now that my boys are 4 and 6, we have all been able to enjoy these long days full of outdoor adventures, family time, afternoons at the town pool, and daily frozen treats. It’s amazing how luxurious it can feel to set up a slip and slide in the backyard and read a book while the boys go from tentative dips with their toes to a full-on water fight. On the sewing front, I spent the first week of July working on the ballet bag quilt, which is inspired by the colors of shoes and leotards from my childhood of dance classes. I think it will be a small wall hanging– the blocks are 2 3/4″ finished. 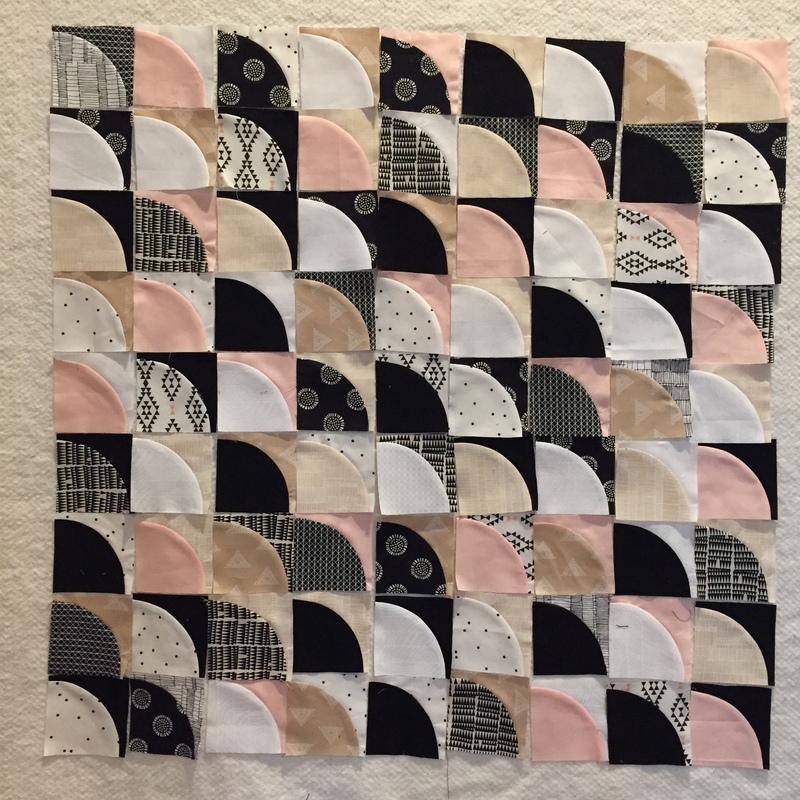 This is the first quilt that I’ve made in a very long time that has such a personal connection to me, and I’m hoping to explore other sides of my identity in future quilts. One afternoon, I got an amazing package from Cloud9 Fabrics— a FQ bundle of Rainwalk from Anna Graham of Noodlehead! 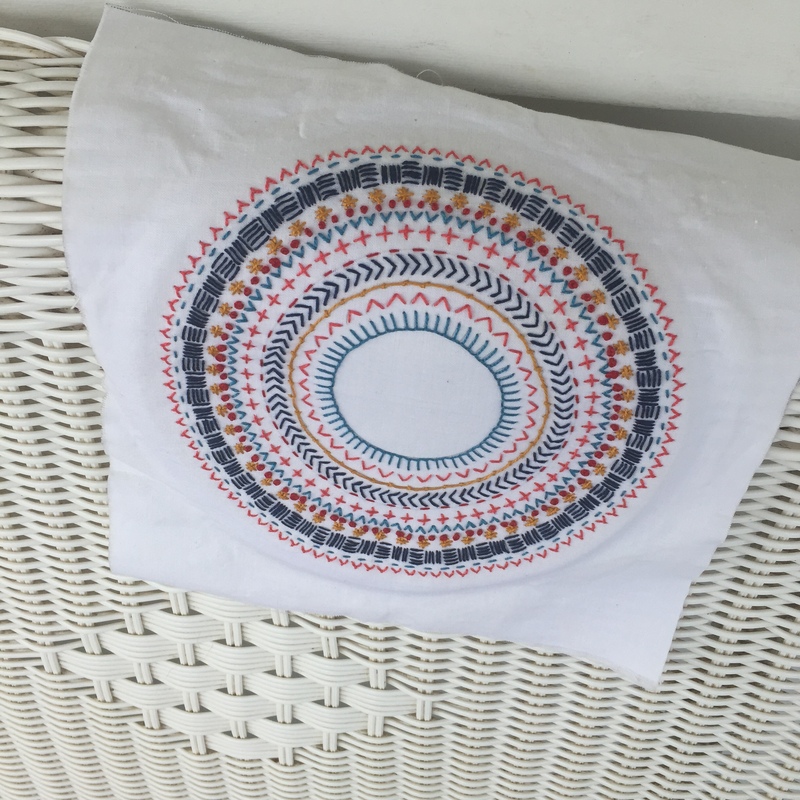 (Her 241 tote pattern is a favorite.) 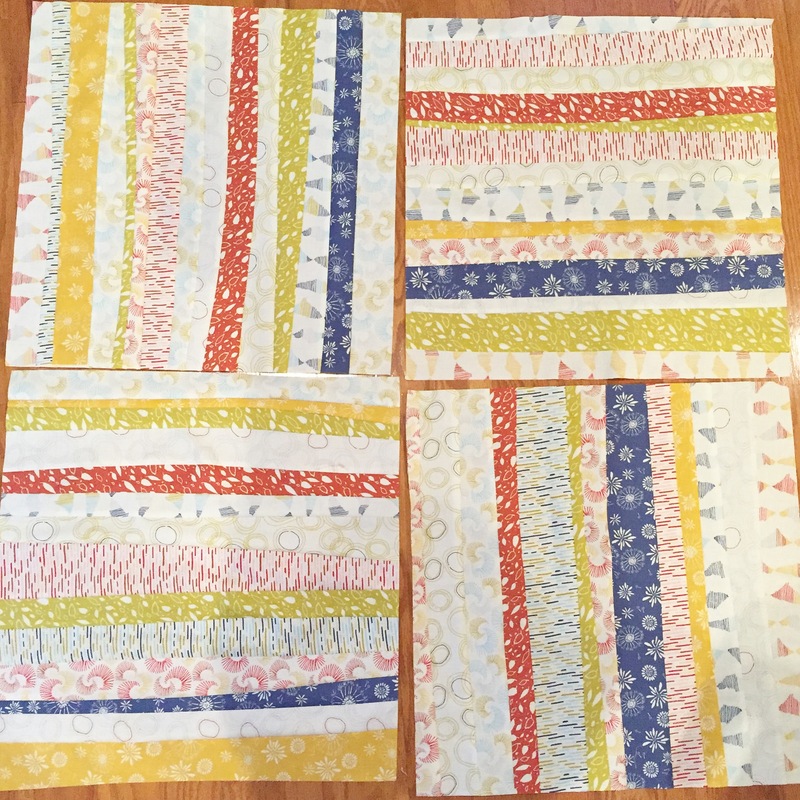 I decided to have a fun improv-inspired afternoon of sewing and make some giant strip blocks like the ones we did in Denyse Schmidt’s class. I love them and hope to finish them as a baby quilt soon. In mid-July, we went with extended family to the Jersey Shore, where we rent a house with a big porch. 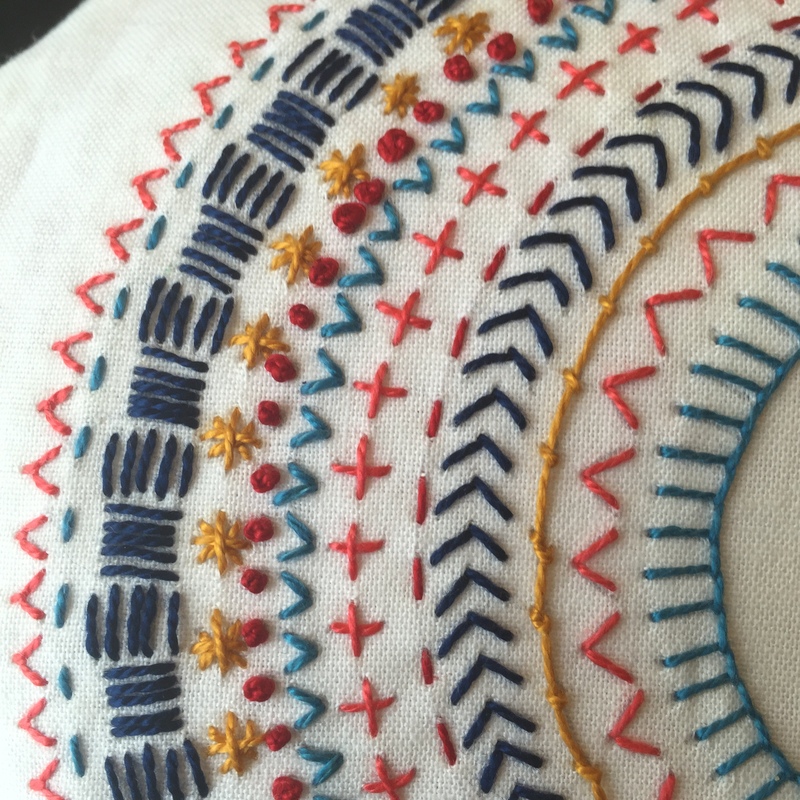 I really enjoyed learning new embroidery stitches in a sampler from Nydia Kehnle, Experienced stitchers had told me that I would get hooked on embroidery, and they were totally right. I used Perle Cotton and LOTs of YouTube tutorials. One of the most luxurious parts of my summer — and I am fully aware of how lucky I am — is to soak in inspiration and art in these more relaxed days. I have plenty more on the horizon for fall (new quilt designs! ), and the kids have a bit of camp still in August, so I’ll be more present here and on social media than I have been for the last month. But posting will still be light until the kids go back to school in September. I hope there is lots of sunshine and color in your world. Sounds like such a nice summer! Love the sampler and the drunkard’s path blocks in those colors! Patiently awaiting the completion of the ballet bag quilt. 😉 Love it so much!